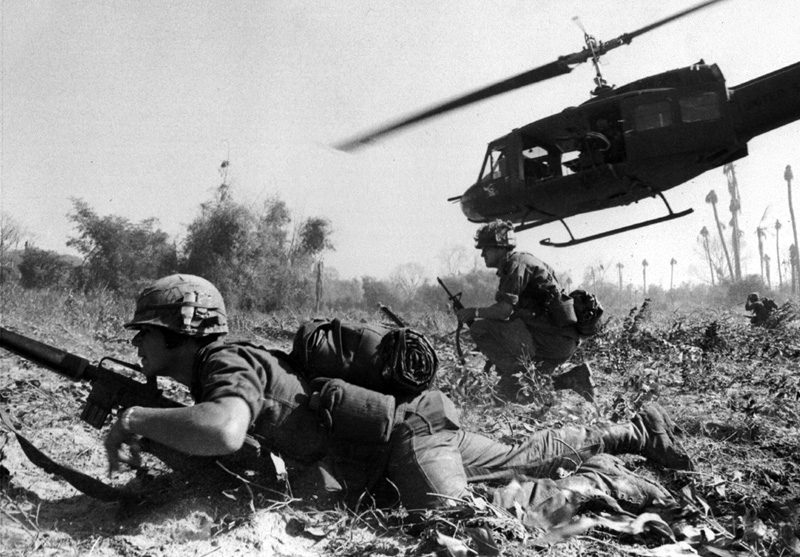 Combat operations at Ia Drang Valley, Vietnam, November 1965. Major Bruce P. Crandall's UH-1D helicopter climbs skyward after discharging a load of infantrymen on a search and destroy mission. Fifty years ago today, November 14, 1965, the first wave of troopers from a battalion of the First Cavalry Division, an elite unit of the U.S. Army that had turned in its horses for helicopters and an experimental “airmobile” assault doctrine, debouched from its Bell UH-1 “Huey” transports into a tree-lined clearing, dotted with patches of elephant grass and red-brown anthills. Suddenly, 90 Americans found themselves in the Ia Drang Valley, deep in South Vietnam’s Central Highlands, a remote Communist base area from the days of the French Indochina War of the late 1940s and early1950s. Army intelligence estimated the presence of a single enemy regiment of about 2,200 soldiers in the immediate vicinity. In fact, Moore’s battalion, the 1st of the 7th Cavalry, had landed within strolling distance of three regiments of the People’s Army of Vietnam (PAVN)—the regular army of North Vietnam. As it happened, the North Vietnamese, too, were looking for trouble. According to Brig. Gen. Chu Huy Man, commander of the Central Highlands front, most of his troops had only recently arrived in the Highlands after an arduous, two-month trek from North Vietnam down the Ho Chi Minh Trail.They had been very active in the area over the preceding month, laying siege to a Special Forces camp at nearby Plei Me. Now they hoped to lure the newly arrived American forces into a major engagement in order to learn their tactics—especially how they used helicopters to deploy infantry units deep inside Communist-held territory, and to keep them supplied in extended operations. Although it is little remembered today, the battle that unfolded over the course of the next three days proved to be one of the most intense and savagely fought ground actions in American military history since World War II. Moreover, it marked a strategic sea-change with profound implications in the violent struggle for control over South Vietnam that had been escalating slowly since 1959. No words do this one justice. I've watched the documentary and read the history. The fighting was savage and like the article says ... the first time the US and the NVA crossed swords.